This column contains an update. Asian Americans and Pacific Islanders, or AAPIs, are the fastest-growing racial group in the United States, increasing at four times the rate of the overall U.S. population. While this population is projected to double in size from 17 million people in 2014 to more than 40 million people by 2060, its voting power has already nearly doubled in the past decade. According to the U.S. Bureau of the Census, there were 2 million AAPI voters in 2000 and 3.9 million in 2012. The AAPI community comprises more than 5 percent of the citizen voting-age population in seven states: Hawaii, Alaska, California, Washington, Nevada, New Jersey, and New York. Although AAPIs are a growing part of the electorate, the community faces a number of barriers to the voting booth, including little or no language assistance; a lack of outreach from community organizations and political parties; and regressive voter ID laws. As the nation prepares for the 2016 presidential election, candidates need to acknowledge and address this growing population. The number of AAPIs in the United States has grown dramatically during the past few decades. In 1980, AAPIs made up 2 percent of the U.S. population, but by 2014, they represented 8 percent. The population is projected to grow to a full 15 percent of all Americans by 2060. Asian Americans are the fastest-growing racial group in the country: While the national population grew 9.7 percent between 2000 and 2010, the Asian American population grew 43 percent. Closely following Asian Americans, the Pacific Islander population grew 35 percent during this same time period. In the past, the political clout of the AAPI community has been diminished by the relatively small size of its population overall; its high percentage of noncitizens; the low voter registration rate among eligible AAPI voters; and the low voting rate of Asian voters compared to their white, black, and Hispanic counterparts. However, the growing population has led to increased political power and has created a base of potential new voters with which political parties and candidates should engage. Moreover, more than one-third of the people who become U.S. citizens through naturalization each year were born in Asia. This rise has led to a significant number of votes cast by AAPIs. While 53 percent of AAPIs identify as either a Democrat or a Republican, about 47 percent are undecided—leaving a sizable portion of the AAPI electorate up for grabs for both parties. AAPI voters—similar to all other voters—are highly concerned about the economy and job creation; the budget deficit; immigration; and Social Security. For example, the National Asian American Survey, or NAAS, found that after the 2012 election, two out of three AAPI voters viewed job creation and the economy as key issues, particularly due to personal financial situations and the effects of the recession. Immigration reform, especially family unification, is another key issue for AAPIs, with 47 percent of Asian Americans rating immigration as either “the most important” or “one of the most important” issues that needs to be addressed. A notable 42 percent of the 4.2 million individuals waiting from abroad to be united with their families are from Asian countries. The Philippines, India, Vietnam, and China are four of the top five countries that face the longest backlogs. For example, the waiting period to obtain a green card totals more than 25 years for the siblings of U.S. citizens from the Philippines. Despite their growing numbers, AAPIs often face many hurdles during the voting process—particularly when it comes to language access. Overall, 35 percent of Asians have limited English proficiency, which is the highest rate across all racial groups. English proficiency among AAPIs varies significantly, from a high of 53 percent among Vietnamese Americans to a low of 22 percent among Indian Americans. Although the Voting Rights Act requires language assistance during the voting process, many AAPIs cannot access translation services due to the range of languages spoken by this community. In a 2012 postelection survey, 76 percent of Asian voters who voted in person or by mail reported that their jurisdiction was required to provide language assistance but did not do so. States such as Georgia, Indiana, Kansas, Mississippi, Tennessee, Virginia, Texas, and Wisconsin have adopted strict voter ID laws, which have further disengaged AAPI voters. The laws require voters to present a government-issued ID, U.S. passport, gun license, or military ID in order to be able to cast their vote. For first time voters, additional documents—such as a utility bill, bank statement, or paycheck—are required. Documents are not easily accessible for portions of the AAPI community—particularly for those who are new citizens or are employed in low-wage jobs. Considering the diversity of AAPIs, voters’ names can be confusing for poll workers, which can result in lost voter registration forms. These state voter ID laws also make it easy for eligible voters to be racially profiled: Many Asian Americans have been asked to provide extra identification forms because they supposedly look too foreign or do not speak proficient English. 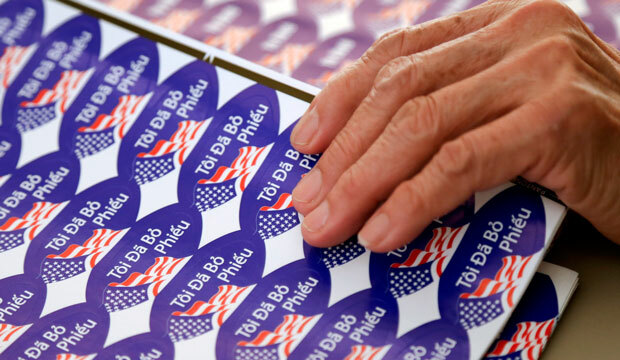 Overall, community groups and political parties struggle to reach AAPI voters. In a post-2012 election survey, the vast majority of AAPIs—69 percent of Asian voters and 74 percent of Pacific Islander voters—expressed that “no one had contacted them about the election.” Only 12 percent of respondents to a 2014 Asian Americans Advancing Justice-AAJC survey said they were contacted by either political parties or community organizations regarding the upcoming election. This lack of outreach translates into fewer people registering to vote. Overall, only 55 percent of Asian Americans who are eligible to vote have registered compared with a national average of 71 percent. Compared to prior elections, the 2012 presidential election showed that outreach to the AAPI community can be fruitful. For instance, then-Sen. Barack Obama’s presidential campaign created a field operation to reach out to AAPI voters—as did community organizations such as the Asian American Political Action Committee and Asian American and Pacific Islander democratic networks. Furthermore, other partner organizations, such as Asian Americans Advancing Justice-AAJC and Asian & Pacific Islander American Vote—a nonpartisan organization—*accelerated efforts at the state level by conducting regional strategic trainings for voter engagement. Ultimately, this strategy paid off, and then-Sen. Obama won 71 percent of the AAPI vote, while only 31 percent of AAPIs voted for former Massachusetts Gov. Mitt Romney (R). The AAPI community is expanding across the United States, and so is its voting power. In order to ensure that this population has full and equal access to the ballot, grassroots organizations, political parties, and candidates must increase their outreach and engagement. Ensuring language access for voters by providing translated documents, translators at the voting booths, and language-appropriate campaign ads are also critical to engaging this population. Additionally, states should be looking for ways to increase citizen participation in the democratic process rather than constructing barriers such as voter registration laws. Given their growing share of the electorate, failing to connect with this community means missing out on a growing base of voters. Sanam Malik is the Special Assistant for the Immigration Policy team at the Center for American Progress. * Update, September 23, 2015: This column has been updated to reflect that Asian Pacific Islander American Vote is a nonpartisan organization that did not endorse candidates in the 2012 election.